When it comes to protein powders, there are literally dozens of different types available. Most are useless (or dangerous) in my opinion. Whey protein is amongst the most popular. 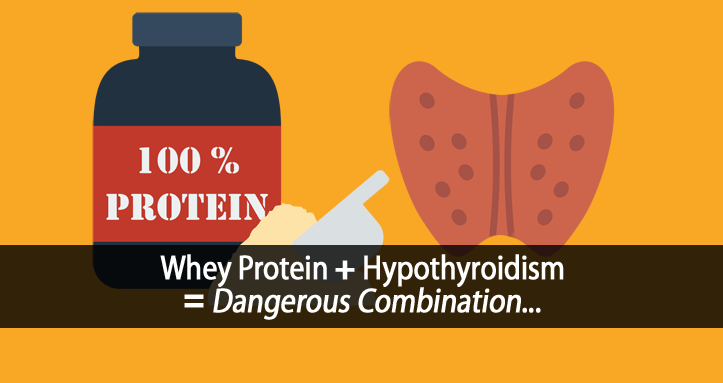 Yet, did you know that hypothyroidism and whey protein are a dangerous combination? Sure, there are many different brands of whey protein all claiming to be something special. It doesn’t matter, and I’m going to show you why in a minute. 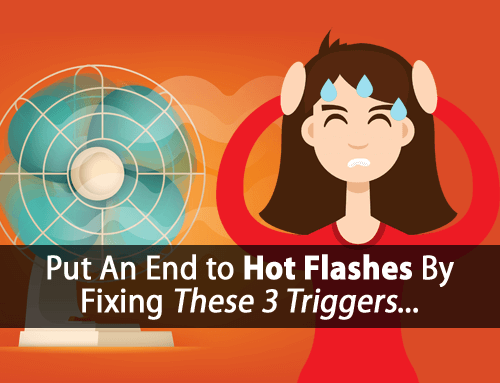 With hypothyroidism, there are many thyroid-suppressive feedback cycles that develop, which keep you trapped in your hypothyroid state. For example, I’ve written about the importance of breaking the Hypothyroidism-Serotonin Cycle. You can read more about that by clicking here. The Hypothyroid-Tryptophan Cycle is a deeper part of that cycle. This study shows that tryptophan is one of a few amino-acids that can directly inhibit your thyroid gland from producing thyroid hormone. 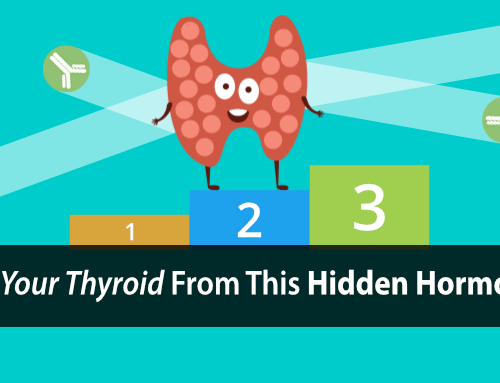 In hypothyroidism, your tryptophan levels rise, which further suppresses your thyroid. Hypothyroidism increases your conversion of tryptophan into serotonin. Serotonin increases your adrenocorticotropic hormone (ACTH). 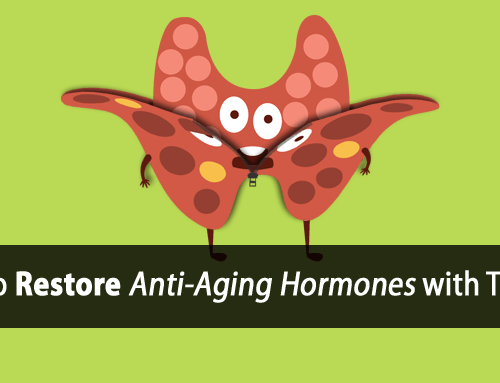 ACTH activates your adrenal glands to increase cortisol production. Cortisol breaks down your muscle tissue, releasing more tryptophan (amino-acid) into your bloodstream. The rise in tryptophan suppresses your thyroid. That tryptophan is then converted into serotonin, and the cycle continues. In other words, hypothyroidism causes your tryptophan levels to rise, which in turn makes you more hypothyroid. So, it should make sense that as a hypothyroid sufferer you want to keep your tryptophan levels low to help break this cycle and improve your thyroid health. But, what does this have to do with hypothyroidism and whey protein? 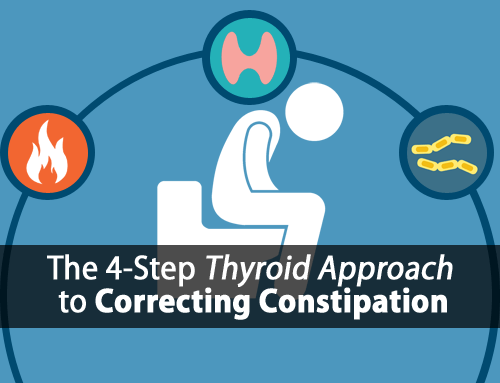 You now know that keeping your tryptophan levels under control is an important part of improving your thyroid health. Whey protein rich in alpha-lactalbumin increases the ratio of plasma tryptophan to the sum of the other large neutral amino acids and improves cognitive performance in stress-vulnerable subjects. This study shows that supplementing whey protein increases your blood tryptophan levels by 42.4%. That’s bad news for your thyroid! Using whey protein perpetuates the very thyroid-suppressive Hypothyroid-Tryptophan Cycle that we’re trying to break. If whey protein isn’t a good option, then what is? With my clients, I use a protein source that helps boost thyroid function instead of hurting it. The protein source I’m referring to is Collagen Protein. It balances other thyroid-suppressive amino acids. And ultimately, it helps support healthy thyroid function. 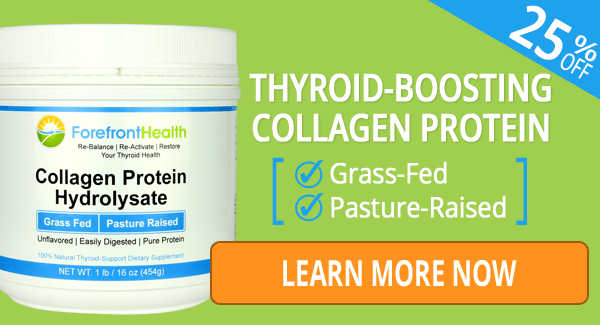 Want to learn more about the benefits of Collagen Protein and how it can help boost and protect your thyroid? I talk more about this and how to use collagen as part of your healthy thyroid diet in this post about “5 Ways to Boost Your Thyroid with 35 Grams of Collagen per Day”. Is this true for actual whey? We have goats, and there is a lot of whey left over when we make some products, and we would like to use it. Whey protein powder is made from whey (byproduct of cheese making) but is much more concentrated. I don’t think that liquid whey would be concentrated enough to have as strong of an effect, but I’ve not seen that studied either. I don’t think there would be benefit to using it either way. Tom — Are there certain types of food that should be avoided or eaten in moderation to halt the Hypothyroidism-Tryptophan Cycle? Like poultry for example? Yes and no. Poultry isn’t necessarily higher in tryptophan than other meats. And we’re not trying to avoid all tryptophan. We don’t want it to become excessive (a 42.4% increase can do that). But we use things like collagen protein and gelatin to help balance the tryptophan in meats. Using whey protein with meat would further increase tryptophan. It’s all about balance. I use Sun Warrior or Vega meal replacement. Are these also harmful since they are plant based? Not something I recommend, but haven’t written about that yet. MY THYROID DOESNT REALLY WORK ANYMORE AS I TAKE MEDICATION SO WOULD THAT APPLY TO ME? Yes, it still applies 100%. May I ask your opinion of organic brown rice protein? I have a container that I was going to use up (I am also taking collegen) if the rice protein won’t hurt my thyroid. Thank you for all of this wonderful information, you are doing a great service to us all. I am wondering if it is normal during the first few weeks of doing the basic daily protocol of juice, coffee and carrot salad, and taking a t3 only supplement, and a bioidentical progesterone supplement, if it’s normal to experience a period of being really mentally unclear as well as getting your menstrual period every 15 days or so. I have been sleeping much better, especially since I have started taking the t3 at night per your suggestion (as well as throughout the day) so I would think that I would feel much more clear and awake during the day. However, it has been difficult to get things done and to do things well (as usual, being hypothyroid). Today I’m starting to feel a little more normal. I just starting the light therapy and the weather has been bleak bleak bleak for the past 4 months, and I’m wondering if that has been the issue.